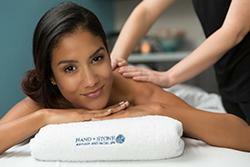 When you need a massage to unwind after a busy week, make an appointment at Hand & Stone. We operate locally throughout University Park, and have membership programs that allow guests to save money while enjoying our services regularly. Whether your neck is stiff or your back aches, our talented staff will be happy to concentrate on any area that needs particular attention. If you want your treatment to feel extra sumptuous, you can ask for an aromatherapy enhancement and enjoy the scent of lavender or another delightful fragrance during your session. Our luxury massages will help you look and feel your best affordably. To schedule our outstanding massage services, contact Hand & Stone today. Our professionals work extended hours to accommodate our clients' busy schedules. You can enjoy a relaxing session at our location in University Park on any day of the week that you're available.